Teeth are arranged in a specific way to keep their position stable, in function and healthy. When teeth are extracted, this stability is compromised. Arches are stable forms in nature and it is no mistake that teeth happen to be set up in such a way. Yet when a tooth is removed from the arch, the resulting space allows teeth to move. Teeth reside in a living, growing and dynamic body tissue called bone. Given adequate time, the growth and change of this bone can cause teeth to tip, erupt out of the bone and spread apart. Teeth have a natural tendency to drift to the midline of the arches. This ensures that spaces do not occur between the teeth. Such spaces are detrimental to a person in that food is impacted between and it can irritate gum tissue. The illustration to the left shows how, given enough time, the remaining teeth can shift and drift when a lower first molar is lost. Such shifting takes time, but 10 to 20 years can, and often does, result in the situation pictured here. When many teeth are lost, especially in the posterior part of the mouth, patients begin to bite more and more heavily on the anterior teeth. Anterior teeth, however, do not have the shape to take the great forces the chewing muscles generate. The illustration to the right shows how the inside surface of the upper front tooth is an inclined plane and the how excessive forces can move the tooth outward. The forces generated when the front teeth contact as shown, can cause teeth to "splay". Splaying causes the front teeth to be push outward toward the lip and thereby creating spaces between teeth. Patients with this situation are said to have a "collapsed bite". Because of posterior tooth loss and the inability to hold the jaws apart, the patient has their nose and chin come in closer apposition to one another. This gives individuals an "aged" look and makes the lower face look geriatric in nature. This is one result of losing posterior teeth, but other negative outcomes are also possible. In constrast to the splaying illustrated in the previous section, other negative consequences of posterior tooth loss can be seen here. The photos to the right show a common situation often found in men when they experience a collapsed bite. A severe wearing of the incisal edges occur. This can produce so much wear over the years, that individuals grind right into the central pulp chamber of the tooth. This wear, called attrition, can be difficult to treat, cause tooth abscesses, lead to fractured teeth and take away from the esthetics of the smile. To compensate for the posterior tooth loss, where teeth usually contact, the teeth now meet edge to edge in order to create closing "stops" on the front teeth. This results in the wear pattern shown. If a few posterior teeth remain and those teeth are in contact with opposing teeth, the incredible forces focused on these remaining teeth, from the chewing muscles, can create abfractions. These are wedge shaped areas of missing tooth structure that look as if an axe has been taken to the root. Teeth are often viewed as a hard, rock-like substance. This is not so. Teeth are full of collagen fibers and other substances that will flex somewhat when put under force, and that flexure produces the defect at the neck of the tooth. While toothbrush abrasion mimicks this and can also contribute to it, stress studies, and the fact that many individuals with these wear patterns have collapsed bites, indicates that excessive forces on a tooth can be a contributing factor to this condition. The area with this wedge defect is above the supporting bone and below the hard enamel. It is essentially, the flexible spot on the tooth. Such flexure causes a break-down in the mineral content of the tooth, which ultimately developes an abfraction. This top (or occlusal) view of a lower first molar illustraes the large surface area that such teeth have to support the forces generated by the human jaws. 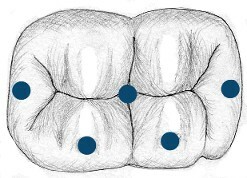 The blue dots indicate where the opposing tooth's cusp tips contact on this tooth. Fossae, or depressions in the surface accept the opposing tooth's cusp. Indicated by the blue points down the center. The blue points on the cusp tips mesh with the opposite tooth's fossae. This scheme works very well and is very stable. It is produced when the teeth are in an ideal position. Tooth loss and subsequent movement often disrupts this contact pattern. 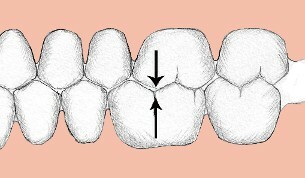 When posterior teeth are arranged like those to the left, we can produce a contact pattern like that seen above. This tooth contact pattern is considered the most common and is referred to as a Class I occlusion. 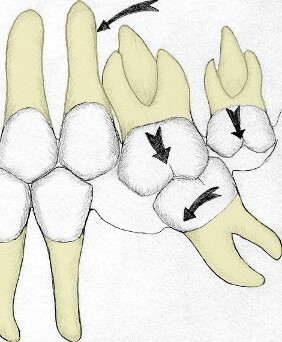 In this scheme, the front cusp of the upper first molar is in line with the groove on the side of the lower first molar. When these line up, all the other cusps and fossae usually line up correctly. Losing teeth, especially posterior teeth, will usually produce some undesireable consequences, but such consequences may occur many years down the road. Sometimes these consequences are irreversible, sometimes they can be rectified with much time and expense. Maintaining posterior teeth to avoid the unfavorable situtations described here is a wise choice for the dental patient.